The purpose of this study is to conduct an analysis of compliance in the expenses incurred with the payment cards of the Federal Government in the year 2016, through the law of Newcomb-Benford. The study was done from the review of articles and publications related to the topic, which have demonstrated your efficiency in detecting irregularities in financial data. The methodology used to carry out the work in question can be classified as hypothetical-deductive, with bibliographical research and, based on the technique of quantitative analysis, using data collected in electronic media-transparency Portal Federal Government. The main results achieved demonstrate a nonconformity in spending with payment cards of the Federal Government, in the light of the law of Newcomb-Benford. The study it can be concluded that there is evidence of the need for better control of public expenditure through the use of Corporate Cards. Keywords: Federal Government payment card, forensic accounting, Law of Newcomb-Benford, public spending. It is known that when playing a dice, the probability of presenting the number 1 is the same for the other numbers. So is presumed to happen whenever you're talking about random occurrence probability of numbers, i.e. an equal probability of occurrence to everybody. The law of NB (Newcomb-Benford) is contrary to that hypothesis of an equal probability of occurrence for the numbers that are in a natural way, as happens when you bet on a game of lottery for example. As soon as the law of NB was introduced in the Middle by authors such as accounting Carslaw (1988) and Nigrini (1999) when outside identified as efficient tool in the detection of fraud and misappropriation in large databases, especially. In research firms and international oversight agencies, NB already is considerably used in audit software as the Audit Command Language (ACL) which features an analysis according to the law of NB, identifying the sample data that suggests the need for better research based on statistical grounds. In the data where it is applicable, if the frequencies of the first digits of data do not present according to the rate provided for in the law of NB, do not constitute conclusive evidence of manipulation or error, as well as a compliance does not ensure trust, however, constitute strong evidence of fraud or error in the data indicating that need a closer examination. Speaking in detection of fraud or manipulation in the socio economic that is Brazil, the need for sound management in the public spending is of immediate need and one of the main mechanisms for both, by obtaining a control effective. The existing State, control mechanisms fail basically by a misallocation of their managers and demand a high cost. 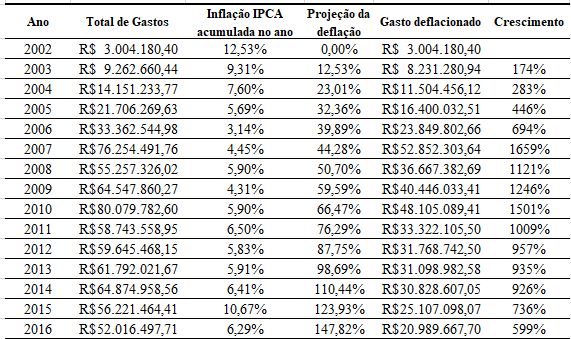 The example of CPGF expenses (payment of the Federal Government) who were in committed irregularities, such as guidelines on Plot Operation conducted by the Federal Police (BRAZIL 2014). This context emerges the following problem of this research: what will be the level of regularity of payment card spending of the Federal Government, that occurred in the year 2016, under the optics of the Newcomb-Benford? So the overall objective of this study was to verify the level of regularity of payment card spending of the Federal Government, that occurred in the year 2016, under the optics of the Newcomb-Benford. Introduce the model in order to add value to the knowledge area of forensic accounting and expand the field of the law of NB. Considering the time of the worst recession in the history of Brazil, of course, means need to be sought in order to reverse the negative results and one of the important factors to be taken into consideration is the quality of public expenditure ( MALIK, 2011). The law of NB presents itself as a forensic tool in investigations, justifying this study when allows more precise selection of data, contributing with the audit work that has a fundamental role both in the degree of confidence of users of information as in the economic development of a country and which the Tribunal de Contas da União-TCU (BRAZIL, 2016), sometimes occupies weeks of work of an auditor with extensive data volumes and difficult analysis. In addition to presenting low cost and effectiveness that collaborate for easy deployment. This work will be presented, in addition to the introduction, on a theoretical framework that will address the public expenditure with emphasis on CPGF, the law of NB in a historical context, the methodology used to achieve the objectives proposed by the study and the results achieved followed the final considerations. Public expenditure a set of expenditures implemented by public entities in the costing of services provided to the company or on investments. The activities carried out for the purpose of purchasing goods or services are classified as expense processing. This processing involves spending and fixing step of your accomplishment (rock, 2007). Public expenditure can only be effected with the authorization of the Legislature through the administrative act called public budget and is processed regularly (P, 2008). Attachment: where is part of the planning process of the resources available (budget recipe) so that they understand the adoption of measures for situations already idealized observing existing guidelines (LDO-LDO) and priorities set by the Government (pluriannual plan – PPA), being manifested through the Annual Budget Law – LOA. Commitment: allocates the resource set to certain purposes for which are conducted. Can be made various endeavors, as long as it does not exceed the limit fixed for execution of expenditure. This threshold through the estimates. The implementation of the budget so it is controlled through the endeavors, allowing a schedule of expenditure with commitments already undertaken and resources still available. Settlement: the settlement of the expenditure occurs in the processing of the object of the commitment. When receiving the goods or service, provided. Thus, the settlement consists of the right acquired by the creditor or the beneficiary entity, of the receipt. Payment: after the right acquired by the lender, which must be based on documents proving their claim or enabling the beneficiary entity, the payment through bank order. On realization of expenditure, there is also the mode of supply of funds, which is a resource to the server for the payment of an obligation already acquired, with future accountability. In order to grant the advance is still required the commitment stage with its own endowment and liquidation (BRASIL, 2015). The payment can be carried out through the Federal Government's payment card, as will be explained later. The democratic regime brings to a State activity threshold for this answer to the satisfaction of the public interest in obtaining the right common to all. Noting that the thing managed does not belong to the Government, but the society as real interested in your good management, it is up to her to preserve it for the people. The entry for this management to a control's natural order to ensure they are being enshrined their rights of a good and effective representation. Cochrane (2003), says that in the framework of the Public Administration, the budget execution control is exercised as a result of legal constraints in order to verify if the acts committed by its servants were executed with legitimacy and mainly in accordance with the public interest. This control assumes one of two ways: as internal control and external control. The internal control "is the set of procedures, rules and goals set by the internal administration in order to comply with the administrative policy of the Organization, providing confidence in the effectiveness and efficiency of resources" (AICPA, 2017 p. 1). It is exercised by the Executive power with the central body the Ministry of Transparency, supervision and Office of the Comptroller General, where your expertise covers all Federal Executive power bodies, except industry bodies. Also the external control helper function in providing useful information. The external control is the control exercised by one entity that integrates the same organizational structure not the organ supervised. Aims to oversee the actions of the Executive power in the application of public resources. Legislative Power is vested in the Office of the National Congress, with the assistance of the Tribunal de Contas da União-TCU in the federal and in most cases the State courts of Auditors-TEC for the States and Municipal courts of Auditors – TCM for municipalities (SA NTANA, 2014). In public administration, control is then the possibility of verification, inspection and examination by itself, by other powers or by any citizen of the effective correction of management conduct a power organ or authority on the threshold to ensure the performance as desired and previously planned generating a systematic Conference (WAR, 2003). The administrative control is being exercised through technical and skilled professionals in the manage and record the acts of the Public Administration and thus provide information to be monitored by who competes. III – the fulfilment of the work programme expressed in monetary terms and in terms of execution of works and provision of services. Already the external control, oversees such practices in the areas of accounting, budgetary, operational, and financial assets. Evaluate the evolution of spending in real time is also a control exercised in parallel with the implementation of the budget, setting boundaries in order to inhibit the disorderly increase of expenses, suggesting corrective measures and the detection of mismanagement, corruption and administrative misconduct. Aspects as to the quality, suitability, effectiveness and satisfaction of the citizen, of the goals that are achieved by the managers, are also controlled seeking ban managers who seek to avail themselves of opportunities for privileges or discrimination (VIRGILIO , 2011, p. 13). As for the costing of expenditure through the CPGF, this is regarded as a way of internal control of that spending, "since it allows the setting of limits on the basis of pre-established parameters as well as monitoring the actual expenditure incurred through the invoices of the cards "(CAMPOS, p. 39, 2006). And which is also subject to external control, later. The Federal Government's payment card-CPGF "is a means of payment used by the public administration in order to give the administration more flexibility, control, and modernity in the management of resources" (NATIONAL TREASURE, p. 4 2017). Is directed to the use of the Management Units-UG of Federal Government, and foundations. Are authorized spending on the purchase of materials and services through CPGF, only those capable of framing as supply of Funds. Theme purpose of serving small purchases of goods and services payment and immediate delivery, framed as supply of funds, in affiliate institutions (Arts. 45, 46 and 47 Decree nº 93,872/86), which may be authorized other expenditures by Act set the Minister of finance and planning, budgeting and management "under the sole paragraph of art. 10 of Decree No. 2005/5,355 (COMPTROLLER GENERAL, 2017, p. 4). The implementation of expenditure by Fund Supply differs from other forms of execution of expense for the commitment to be made in the name of the server, the advance and the amount and the absence of compulsory bidding. For carrying out such expenditure should be observed the principles governing Public Administration as legality, impersonality, morality, publicness and efficiency, as well as the principle of equality and acquiring more advantageous to the Administration (COMPTROLLER GENERAL, 2017, p. 5). Are responsible for the management of these resources, the expense of Computers each unit Manager-UG. Should be provided by accounts Supplied, within the time limit laid down in the Act of granting supplies you received. If there is no accountability within the deadline set, or it contains any failure or irregularity, is the Originator of expenditure notifies him immediately to introduce accountability, remedy the failure or collapse the Treasury account Values corresponding to national applications considered unethical, getting the Agent Supplied subject to the Special Account or the discount on the payroll of the corresponding importance if you do not respond to notification. Can be identified in table 2 below, which CPGF spending come suffering considerable increases significantly in the last 15 years. The evolution of expenditures was carried out on the basis of the total expenditure of the year of 2002. Table 1-evolution of CPGF spending over the past 15 years. Source: Portal of the Federal Government's transparency/IBGE, adapted. Simon Newcomb (1835-1909), a Canadian-American astronomer and mathematician, at the end of the 19th century noted that the books of tables of logarithms contained greater wear from use on your pages where the first digit of the logarithm began with smaller numbers, such as 1 and 2 , and such deterioration was noticeably higher than in the pages where the logarithms starting with larger numbers like 8 and 9. Your comment was published in the American Journal of Mathematics, in 1881, note on the frequency of use of the different Digits in natural numbers. And he performed as "natural numbers" those that occur "in nature", that is, numbers that arise in the normal course of daily life without any preconditions or manipulations. Figure 1-frequencies of the first digit calculated according to the law of NB. Source: own elaboration. For a set of data be considered punishable by law test of NB, their values must represent the magnitude of the event or fact; the DataSet cannot be small or contain small variations. In this context, it has been shown rigorously by Hill (1996) that the distribution of distribution of random numbers, collected from a variety of different distributions follow the distribution of NB. Newcomb (1881) and Benford (1938) stated that in nature there are more numbers starting with digits of smallest value and that statement aligns the limitation that is the result of scarcity of natural resources. What might have remained as a mere mathematical curiosity became considered by Benford, as investigative journalist, useful when used in the discovery of fraud in large quantities as numerical balance sheets and statistics (rock, 2007). Nigrini, one of the forerunners of the NB law enforcement amid accounting, did so based on your thesis of Ph.d in accounting (Ceccato, 2013). He assumed that real data would result in accordance with the law of NB and your research has indicated exactly that way, demonstrating that significant deviations in relation to the Law denote the possibility of fraud or manufactured. He developed tests to measure compliance with the law of NB and they detected fraud in seven companies of New York. 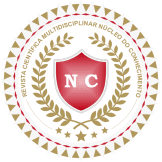 The discovery was reported by the Wall Street Journal and Nigrini was asked to give advice to the organs of collection of taxes in various countries with mention of installation of NB in fraud detection software. It is worth mentioning that the tools for analysis according to the law of NB, including software, do not prove the existence of fraud, manipulation or error, just identify data demonstrating your deserving of further study. Durtschi (2009, p. 23) clarifies that "existing digital analyses should not be complement other tools and should not be used alone. In Brazil, Santos at al. (2007) showed the applicability of the model based on Law of Newcomb-Benford in the process of tax audit of ISS in a northeastern city, signaling the possible deviations with the issuance of the notes bookkeeping tax, which were confirmed by the results of the monitoring carried out. Ceccato (2013) presented a study according to the optics of the NB Law on public works budget spreadsheets for analysis of mark-up. We analyzed the construction of three stadiums for the 2014 World Cup, including the Mané Garrincha, in order to verify your applicability in this context. The results were compared to the results of audit performed by TCU, achieving the same results on both the methods indicated overpriced. At coast. Al (2013), in a study to assess the applicability of the law in places of continuous audit, conducted law analysis of NB in commitment of management units 60 Northeast State of the year 2010. Highlighted in the results observed in the realization of a temporal analysis of compliance with the law, the possibility to determine with greater precision elements of interest in the formation of samples applied in the light of the Law, in an audit environment continues. Through this work to then present an analysis on payment card spending of the Federal Government (CPGF), contemplating the tools in this context are already used in the identification of possible deviations. As for the scientific method, it was assumed the hypothetical-deductive that to Karl Popper (1975) apud Gil (2008), when the knowledge is insufficient to explain a phenomenon, then a problem arises; in order to express the difficulties of the problem are formulated hypotheses; case be deducted consequences that will be tested or falsified, looking for empirical evidence to confirm or if you reject a hypothesis. Given the problem of research, has been established then a null hypothesis and an alternative, where the null hypothesis (Ho) will be considered an act of NB. The survey was based on a quantitative approach, descriptive, since after register and analyze a particular phenomenon (compliance in the distribution of first digits of CPGF costs in relation to the distribution defined by the NB) sought-correlates them and describe their characteristics. It was used as a means to bibliographical research, based on books and scientific articles already published as well as Excel spreadsheets containing the CPGF expenses for the years 2016, available in the Portal of the Federal Government's Transparency in Middle electronic (www.portaltransparencia.gov.br/). The NB Law was applied to the data in the way they were originally presented. The database didn't go through any prior treatment, being used as they were provided by the portal. This determination was given by the fact that the law allows for the selection of items in a database, which could contain errors, have been manipulated or represent fraldes and the results achieved represent the sample for audit. This study was inspired by the work of Chan (2015), who performed your research on the expenses incurred in the Federal Government, the year of 2013. As limitation of the search, the object of the analysis data were obtained on presentation that was done in compliance with the law of transparency through a Web portal, not original documents certifying security and trustworthiness to the data. The following will be presented the tests that have been applied, highly regarded and featured second Nigrini (2012), for the examination of the actual frequencies found-from data-compared to the expected frequency of the digits, provided for in This Act. This test was also carried out, proposed by Nigrini (2012) for analysis of large databases, for being more accurate than the previous test. Here, a low compliance with the NB Law suggests, generally, a high risk of the existence of error or fraud. Where in "K" will be represented in the series of digits, for example, nine for the first digit, PR = actual ratio and PE = expected ratio. The Average Absolute Deviation is an important test to be applied since, unlike the variance and the standard deviation, in your metric data dispersion does not suffer high influence mixed in the distribution. For this test there are no critical values. Nigrini and Dark (2000), through your personal experience in testing of databases by Newcomb-Benford, provide guidelines for critical values. Nigrini (2012), by simulating distributions under the optics of Newcomb-Benford, found that the total numbers belonging to each group formed by the first two digits 10, 12, 11, … , 99 resulted in values to a proportion of 1/90, i.e. approximately equal total values for each group. Soon, this test consists of the sum of all the numbers, per group, which had been formed in accordance with their first digits. The author also found that real numbers rarely follow this proportion, because only some very high values and mixed of remaining, or are a lot of small or medium value values. The application of this test is exactly for an alert about this fact. Should be analyzed data groups presenting different proportion of expected, being, of 1/90. The data obtained in the Portal of the Federal Government's Transparency, 114077 CPGF expenditures were identified in the year 2016, whose analysis is made below. 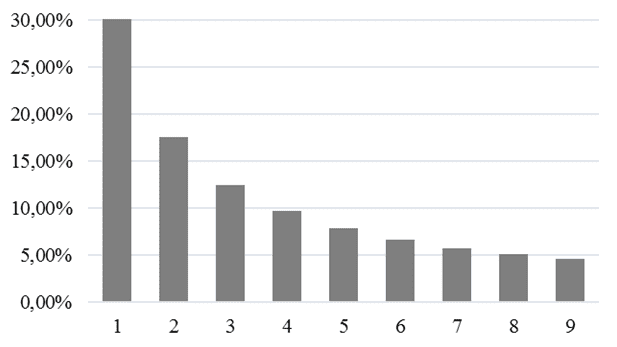 The following chart shows the frequency distribution of data with respect to the expected frequency, given the law of NB for the first digit. Chart 1-Test the first digit to CPGF spending. Source: own elaboration. The result of the chart 1 shows that the distribution of data in a downward curve analysis as well as proposes the distribution of NB to the probability of occurrence of the first digit. 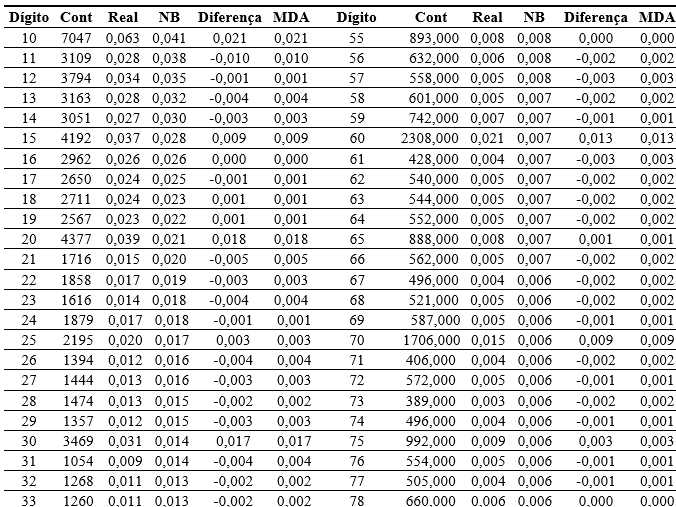 Table 3 below shows the test result of the average absolute deviation (MDA) given the actual frequencies reached the first digit. 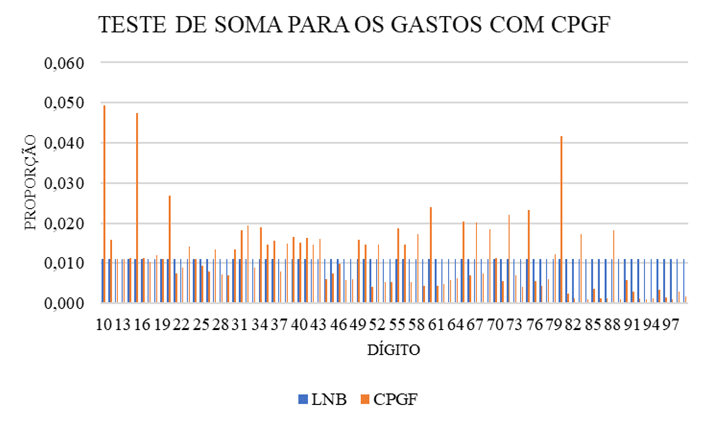 The actual frequencies of the first digits of each spent on CPGF presented a proximity to the distribution established in the law of NB. The digits 3, 6, and 8 have exactly the rate provided for in the said law. About the deviations found in the other digits, the result of the test of the average absolute deviation (MDA = 0.004), demonstrates an approximate compliance data in analysis. The chart 2 below shows the frequency distribution of data with respect to the expected frequency, given the law of NB, for the first two digits. 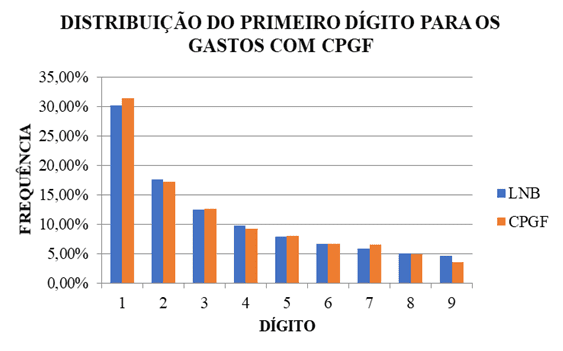 Graph 2-testing the first two digits to CPGF spending. Source: own elaboration. As well as the previous test result, the actual frequency features downslope. The peaks of the digits 10, 20, 30, 40, 50, 60, 70, 80 and 90 indicate the need for better assessment of the same. 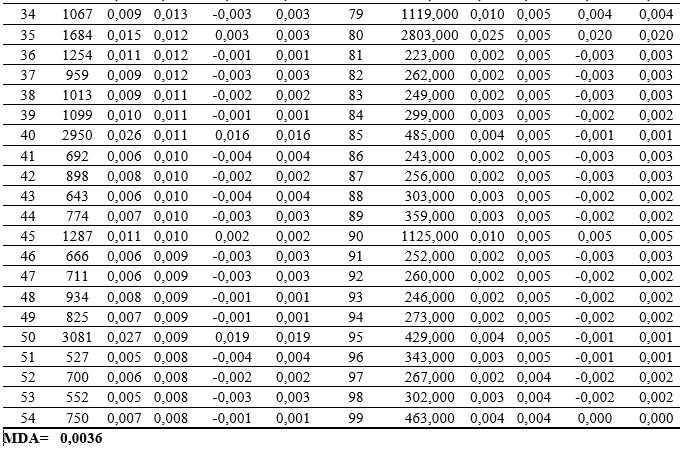 4 the following table demonstrates the results of the average absolute deviation (MDA) given the actual frequencies reached the first two digits, held to ensure the need for evaluation of digits that have shown higher chart 2 deviate from above . Table 4-testing MDA, for the first two digits of CPGF expenses. Source: own elaboration. 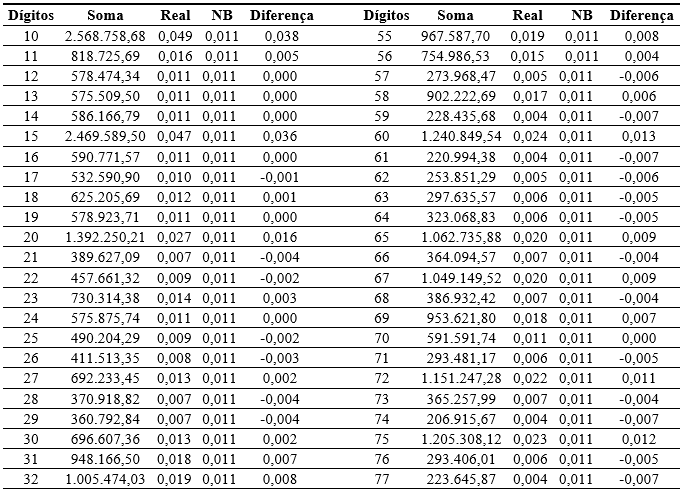 For the test of the first two digits, the digits 12 16, 18, 19, 55, 78 and 99, showed exact frequency expected the law of NB. But here, even the remaining digits showing a small deviation between 0.005 and 0.001, the average absolute deviation presented a noncompliance with the law of NB. To analyze the test results of the sum together with the test results of the first two digits, confronts the amount of data in each group with the sum of their values. With that, the relevance and materiality of each group to identify digits that suggest the need for a more thorough analysis about these values, be they identified. The chart 3 below shows the test result of the sum to CPGF spending. Graph 3-Sum test to CPGF spending. Source: own elaboration. 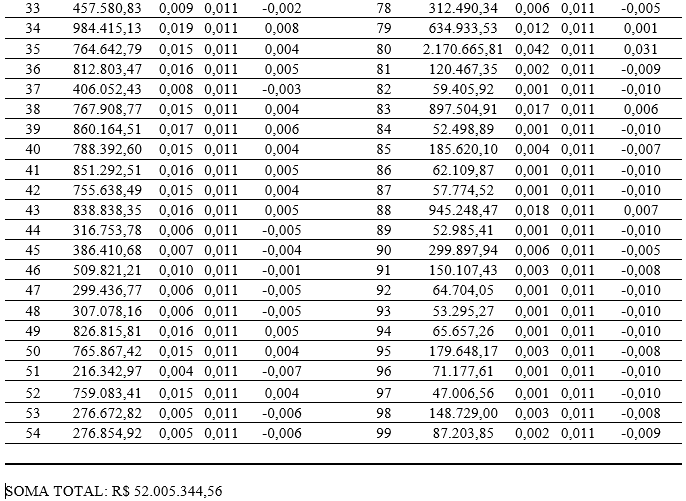 5 the following table demonstrates the results of the sum, detailing, in order to ensure the need for evaluation of digits that have shown higher chart deviate 3, above. Table 5-Sum test to CPGF spending. Source: own elaboration. The test of the sum, for your time, detected a significant unconformity in the light of the law of NB, with values in relation to the expected average 165% above the value of 1/90 and below the proportion expected only 10% on average of the value. The digits 10, 15, 20, 60, 72, 75 and 80 represented the most significant digits in this test. In an audit, it would be the first for a more thorough analysis by also singled out the test of the first two digits. Said was, during the work that results in compliance with the law of NB not conclusive irregularity, but constitute evidence that assume the need for better analysis of the same. In the case of an analysis on payments figures, the digits that if presented with a greater degree of noncompliance in sum test (table 12), as the digits 10, 15 and 80, indicate some high-value transactions or many low-value transactions, the that requires according to the model, a deepening in the analysis. With the end of example of this model, sought a more detailed initial identification of possible reasons for divergence, looking for evidence that irregularity could contain 10 digit-related spending, which have contributed to this digit checks in with the greater relevance of deviation with respect to the law of Newcomb-Benford. Table 6 – analysis of the composition of spending started with the 10 digit. Source: Portal of the Federal Government's transparency, adapted. Outside that legal use contextualized the supply of funds through the CPGF, do not configure a rule, but the exception. Identified in this analysis, as described in the table above, were presented in spending significantly large incurred in a common destiny. To use CPGF, you must identify the impossibility of such expenditure to be submitted to the normal application process, in addition to expenses that have repetitive character are not funding through the supply of funds, once considered predictable therefore not justifying your specialness. For the funding through this modality of payment of expenditure, shall be identified both the lack of contractual coverage, how to recognize that it is not the same object/signings interruptible service planning, so that along the exercise will not be characterized as fractionation of expense and as a consequence, to the bidding process required. Without fail to mention also the amount of withdrawals, you couldn't identify the nature of the expense and are allowed only in exclusive cases where there is, in addition to the specialness of the expense, a justification of your use, when the expenditure through the Supply of funds should be made preferably by means of invoice. The use of the Funds supply can be accomplished through withdrawal only when the payment is not feasible through the CPGF, what can happen in an individual supplier that don't have machine for the use of the card. The manual of the CGU, which brings clarification about the use of the CPGF, still alert that your use in costing of expenditure with restaurants, events, or in the purchase of foodstuffs for preparation in their own division or out of this, with ready meals, should not be held for supply of Funds. Sought to also analyze spending, could, with even more critical, because of the large amounts of spending on a same type of supplier, when costs have been identified, which will be presented in table 15 below. Table 7 – analysis of the composition of spending started with the 10 digit, by fate. Spending on alcoholic beverages, both held in the locality in which is situated the organ as outside it, are considered ineligible, in other words, cannot be paid with public funds, except in official receptions. The present study aimed to evaluate the model based on Law of Newcomb-Benford is applicable to the work of supervision over public spending, spent with the Federal Government's payment card-CPGF, in order to identify a more practical method low cost, to be incorporated into the audit procedures, improving and contributing to better management of public spending that is necessary. This study, in your proposal to demonstrate the law of Newcomb-Benford as this tool that can contribute to greater efficiency of the control of public expenditure audit, identified possible irregularities in the funding of expenditure on the CPGF especially when excessive spending of repeats identified the same nature, and the legality of your use has exceptional character and potential. Considered the high growth in the costing of expenditure through the CPGF, featured those quiet, illustrated the necessity of an efficient control and with clear targets and actual range. The results achieved, statistically significant deviations with respect to the expected frequency provided for in the law of Newcomb-Benford, lead to rejection of the null hypothesis, that indicates compliance with spending CPGF. It is assumed that through the results of noncompliance, not confirm fraud or irregularities, but that the results presented here, demonstrate the need for a more accurate research on such spending, indicating the existence of a likely ineffective control. It is recommended the application of unit-UG Manager model, using the application of statistical tests such as the Z-Test and Chi-square when these are indicated for use in small databases. AICPA, Internal control, 2017. Available at: <http: www.aicpa.org/interestareas/="" informationtechnology/resources/auditing/internalcontrol/pages/default.aspx="">accessed: 14 May.</http:> 2017. BENFORD, Frank. The Law of Anomalous Numbers. Proceedings of the American Philosophical Society, vol. 78, no. 4, 1938. Brazil. 4,320 law of 17 March 1964. Available at: <http: www.planalto.gov.br/ccivil_03/leis/l4320.htm="">accessed on: 23 Apr.</http:> 2017. BRAZIL, complementary law 101 of 04 May 2000. Available at: < http://www.planalto.gov.br/="" ccivil_03/leis/lcp/lcp101.htm=""> accessed on: 25 Apr. 2017. BRAZIL, InovaTCU: applications of Benford's law to public works audit 31 jun. 2016. Available in < http://portal.tcu.gov.br/inovatcu/noticias/aplicacoes-da-lei-de-benford-a-auditoria-de-obras-publicas.htm#_ftn1=""> Access in: 27 jun. 2017. BRAZIL, the supply Manual (theoretical part), 16 10. 2015. Available at: <https: www.ufmg.br/proplan/wp-content/uploads/suprimento-de-fundos-1-parte-te%c3%b3rica.pdf="">accessed: 15 mai.</https:> 2017. BRAZIL, the Transparency of the Federal Government, 2017. Available at: <http: www.portaltransparencia.gov.br/portalcartaocorporativoportador.asp?ano="2016">accessed: 23 mar.</http:> 2017. BRAZIL, Portal. Federal Police: Fighting Fraud with Corporate Card of the MTE, 28 mar. 2014. Available in <http: www.brasil.gov.br/defesa-e-seguranca/2014/03/pf-combate-fraude-com-cartoes-corporativos-do-mte="">Access in: 29 mai.</http:> 2017. FIELDS, Marcus Aurelius. Transparency of federal spending: the external control on the funds invested through the supply of funds. 2006. 96 p. Monograph of specialization in public accounting, Graduate program Serzedello Corrêa Institute of TCU in partnership with the University of Brasilia. CARSLAW, Charles. A. p. n. Anomolies in income numbers: evidence of goal oriented behavior. The Accounting Review, Usa, Vol. LXIII, no. 2, p. 321-327, Apr. 1988. CHANDRA, Gustavo Henrique de Vasconcellos. Law enforcement Newcomb-Benford in the identification of irregularities: the example of the payment card spending of the federal Government. The Attorney General of the Central Bank, vol. 9, nº 1.2015. CECCATO, Flávia r. c. Newcomb-Benford Law applications to auditing of public works. 2013. 486 f. Dissertation (master). Faculty of Economics, administration and accounting, University of Brasília, Brasília. 2013. CGU, Manual Payment card of the Federal Government, 2017. Available at: <http: www.cgu.gov.br/publicacoes/orientacoes-aos-gestores/arquivos/suprimento-de-fundos-e-cartao-de-pagamento.pdf="">accessed: 29 Apr.</http:> 2017. Cochrane, Therese M.C. The importance of internal control in the brazilian public administration and Accounting's contribution as the main instrument of control in pursuit of efficiency of public administration. 2003. 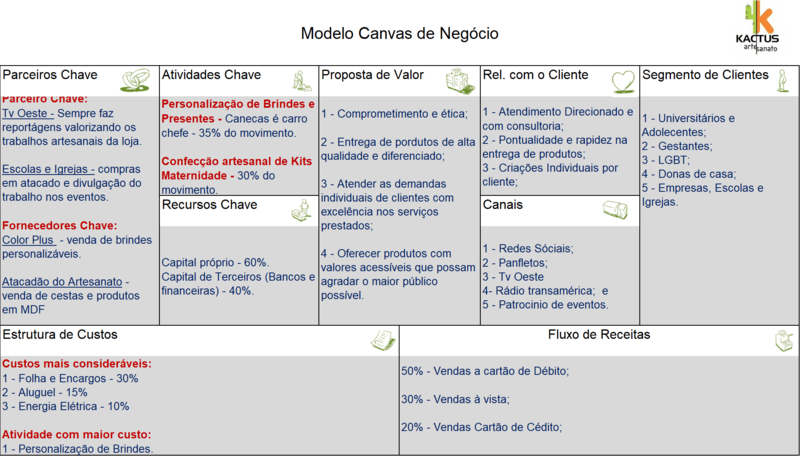 21 p. Work presented at IX accounting Convention of Rio Grande do Sul. DURTSCHI, Cindy, at. Al. The Effective Use of Benford's Law to Assist in Detecting Fraud in Accounting Date. Journal of Forensic Accounting, v. 5, p. 17-34. 2004. Available in: <http: www.auditnet.org/articles/jfa-v-1-1734.pdf="">.</http:> Access in: April 15, 2017. GIL, Antonio Carlos. Methods and techniques of Social research. 6th Ed. São Paulo: Atlas, 2008. GAMST ST.JAMES, A. C.; RAMIREZ, f. composition of public expenditure and economic growth: A Macroeconomic Evaluation of the quality of public expenditure of the Brazilian States. Applied economics, vol. 11, no. 4, p. 463-485, 2007. WAR, Evandro Martins. The External and Internal Controls of public administration and courts of accounts. Belo Horizonte: Forum, 2003. HILL, Theodore p. Bas e-invariance implies Benford's law, Proceedings of the a. m. s. 1996, USA, Society Vol. 123, no. 3, pp. 887-895. IBGE, consumer price Index-IPCA/INPC, available at: <http: www.ibge.gov.br/home/estatistica/indicadores/precos/inpc_ipca/defaulttab.shtm="">accessed: 12 mai.</http:> 2017. NEWCOMB, Simon. Freqwency of Use of the Differelnt Digits im Nuw Natural & ers. American Journal of Mathematics, vol. 4, no. 1. (1881), pp. 39-40. NIGRINI, Mark. J. I ´ ve got your number. Journal of Accountancy, Ny, vol. 187 In. 5, p. 79-83, mai. 1999. NIGRINI, m. j. Benford's Law. Applications for Auditing, Forensic Accounting and Fraud Detection. John Wiley & sounds, New Jersey, 330 p. 2012. Mark j. NIGRINI, & Dark, s. j. Date diagnostics using second-order tests of Benford's law. Auditing. The Journal of Practice & Theory, vol. 28, no. 2, pp. 305-324. Nov. 2000. Paiva, Simone Bastos. A discussion about the non-definition of public expenditure in the area of public accounting legislation. Brazilian accounting magazine, Brazil, no. 171, mai. 2008. SANTOS, Michela, et al. Applications of Law of Newcomb-Benford on Tax Audit of the tax on services of any kind (ISS). Accounting magazine, vol. 20 Finance &, paragraph 49, 2007. NATIONAL TREASURE, Manual Payment card of the Federal Government, 2017. Available at: <http: www3.tesouro.gov.br/programacao_financeira/downloads/="" manual_cartao="" _pagamento.pdf="">accessed on 30 Apr.</http:> 2017. Virgilio, Salman Vieira. The control and transparency as tools to combat Crimes of public management. 2011. 17 p. Paper presented at the 1st competition of scientific papers of the ASBAN and JUNIOR/GO. Accounting course of the Centro Universitário de Brasília (UniCEUB).